‘The Ties That Bind: The River Collection’ 4CD/3DVD Box Set Out Now! Columbia Records released Bruce Springsteen’s ‘The Ties That Bind: The River Collection’ on December 4th, 2015. A comprehensive look at ‘The River’ era, the set contains 52 tracks on 4 CDs with a wealth of unreleased material, and 4 hours of never-before-seen video on 3 DVDs. 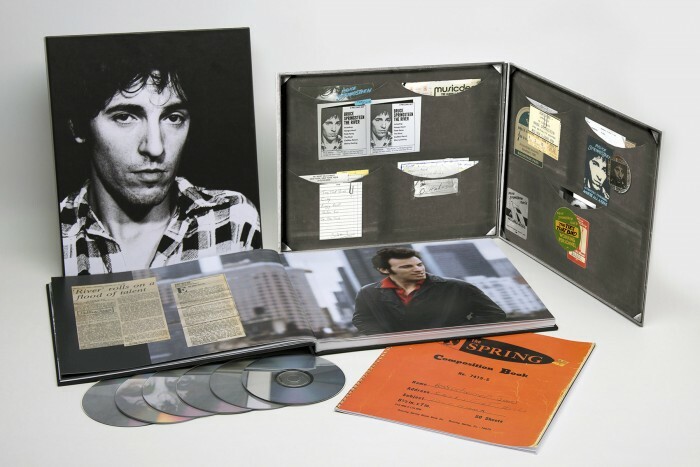 It is comprised of the original ‘The River’ double album; the first official release of 'The River: Single Album;' a CD of 1979/80 studio outtakes; a two-DVD film of never-released, newly edited multi-camera footage from Springsteen’s famed 1980 show in Tempe, AZ, long rumored but never-before-seen; rare tour rehearsal footage; a brand new documentary “The Ties That Bind" about 'The River;' and a coffee table book of 200 rare or previously unseen photos and memorabilia with a new essay by Mikal Gilmore. "The Ties That Bind” is a brand new 60-minute documentary produced and directed by Grammy and Emmy-winning filmmaker Thom Zimny that features an intimate interview with Springsteen as he reflects on the tumultuous, extended period writing and recording ‘The River.' The film transitions between Springsteen telling the stories behind the music — and illustrating them with solo acoustic guitar performances -- interspersed with period concert footage and rare photos of Bruce and the band in and out of the studio. The final video component is "Bruce Springsteen & The E Street Band: The River Tour, Tempe 1980," a new film produced from footage professionally filmed in 1980 using four cameras and recorded in multitrack audio. The film features 24 songs — 2 hours, 40 minutes — on 2 DVDs from Springsteen’s November 5, 1980 concert at Arizona State University in Tempe, AZ. Widely regarded as one of Springsteen’s finest performances, this intense show features early live versions of over half of 'The River' songs. Also included is 20 minutes of footage from the late September, 1980 River Tour rehearsals held in Lititz, PA, showing Springsteen and The E Street Band working through live arrangements of what was then unreleased material from the upcoming album. ‘The Ties That Bind: The River Collection’ is now available at Amazon (4CD/3DVDs or 4CD/2Blu-ray) and iTunes.